Category: Feature Greenhouses On Sale, Five Wall Polycarbonate Greenhouses, Free Standing Greenhouses, Over $20,001, Traditional Series, Traditional Series - On Sale, More..
Commercial Greenhouse Sale! 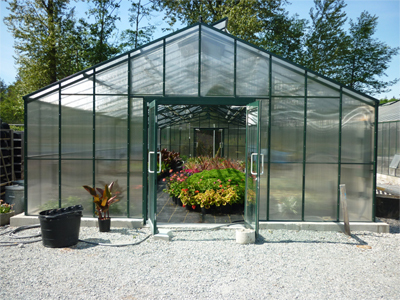 This Fivewall Polycarbonate Commercial Greenhouse is one of our most popular greenhouses and is on sale everyday! This Feature Five Wall commercial polycarbonate greenhouse kit is larger is size and built to withstand harsh weather conditions. This large commercial greenhouse kit is available with traditional straight eaves, making this quality greenhouse an architectural delight. The 16mm Five Wall poly efficiently traps heat that is produced by the sun insulating it against the cold. Polycarbonate also minimizes against interior condensation. The light transmission of Fivewall polycarbonate is slightly lower at 62%. The benefit is an improved R value of 3.03 which is a 21% improvement over 16mm thick triple wall poly. This means that greenhouses glazed with our fivewall polycarbonate will cost 21% less to heat than triplewall polycarbonate glazing. In addition, the fivewall polycarbonate is about 50% more efficient than insulated double glass, 10mm triplewall polycarbonate and 8mm 4 wall polycarbonate. It is approximately 80% more efficient than 6mm or 8mm twin wall polycarbonate. Arguably, this is the most energy efficient glazing material available in today's greenhouse market. The durable aluminum frame for the greenhouse comes with an attractive enamel paint finish. Large automatic roof vents provide air circulation and standard storm/screen door comes with a key lock. This feature greenhouse includes a twinwall polycarbonate insert for the door for added insulation, or you can upgrade to a double glass storefront door. Double doors are also available. Picture shows a pair of double glass storefront door upgrade. Height to center ridge is 10' 3 3/4"
Add on the attractive Victorian Trim Package to enhance the charm and elegance of your greenhouse. Your Victorian Trim Package can be selected in the Options Box below. Picture shown may not be actual size. Picture shown has upgrade to a pair of double glass storefront doors.